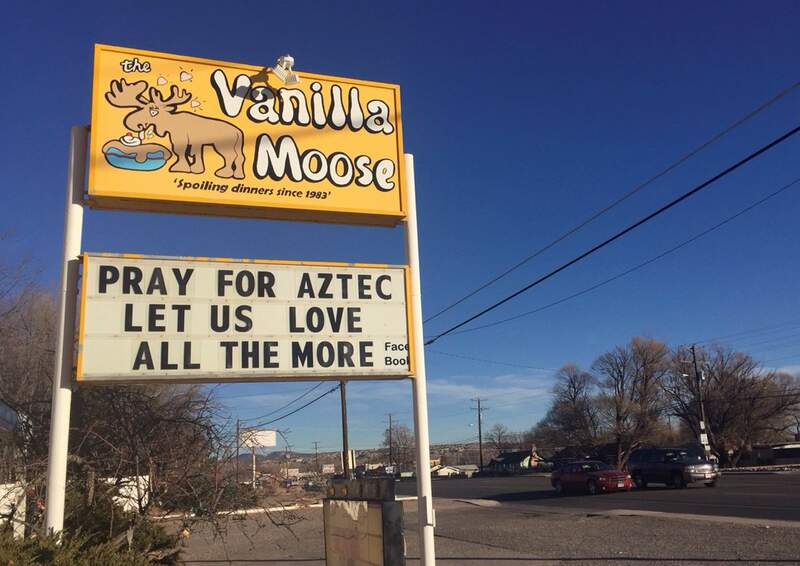 A sign encourages prayer outside an ice cream shop in Aztec the day after a shooting at Aztec High School on Dec. 7, 2017, in which two classmates were killed before the gunman killed himself. Three months after a gunman killed two students at Aztec High School, the small town just across the Colorado border is getting national media attention from National Public Radio. Last week, Kirk Siegler an NPR national desk correspondent, spent a few days in Aztec to interview students, school officials and community members about how they are healing and what they feel needs to happen to prevent gun violence in schools. “I feel like my security has been taken away from me,” Sarah Gifford says. ‘Three months ago, the 17-year-old junior was in the hallway just a few minutes before a 21-year-old gunman, who’d posed as a student, walked up and down firing randomly. He killed two students before turning the gun on himself as police closed in. ‘I don’t even go to the mall or Walmart the same way because I’m scared someone’s just gonna come in,’ Gifford says.